Explain how it applies to your professional work dynamics. Describe how the theory would designate the team member roles and responsibilities. Explain how participation, leadership, and motivational skills would be demonstrated according to this theory. Describe how the theory affects your perspective on group interaction in the workplace. Maslow’s Hierarchy of Needs Maslow believes that needs follow a certain order: Physiological which are needs of the body, safety needs where people join together to protect themselves, belongingness, this is the need to belong or beloved, esteem needs which reflects the desire to feel wanted and self actualization needs, which is to become the best. Schultz’s FIRO Theory	FIRO theory which means Fundamental Interpersonal Relationship Orientation is the state that most people share. The need for inclusion for control and for affection. Tuckman’ Stages	This stage states that groups go through four basic stages forming, storming, norming and performing. Fisher’s Phases	Fisher focuses on decision making. There are four phases to this group; orientation, conflict, emergency and reinforcement. Integrated Model	Tuckman stages and Fisher phases these theories are similar although they use different words to explain the process. While many psychologists and other theorists spend their time studying anomalies that make some individuals less successful than others, Maslow spent most of his time looking at those particularly successful people who had it all together and asking himself what happened to make them so successful. 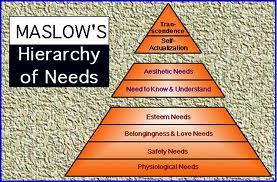 What Maslow found is that there are certain requirements that all humans share in order to be productive and happy. He grouped these requirements into categories of successive need. If an individual could meet the most pervasive needs, he could then become involved with trying to satisfy the needs at the next level. Paper Masters writes custom research papers on Theory of Work and examine a paper ordered on a specific theory of group interaction and development.